As I had previously mentioned here, I’ve been working on a book about historic German and Austrian beer styles and how to brew them at home. Finally, today was the big day: the book is finally published! It’s called “Historic German and Austrian Beers for the Home Brewer” and can be purchased on Amazon as an e-book. You can get it here on Amazon.com, here on Amazon UK, and here on Amazon Germany. If you’re from another country, just search for the book title on your country’s Amazon website. Work on the book started in November 2016, shortly after I had released my previous book which is shorter, in German and has a broader focus. The overwhelming feedback back then was that there was a huge interest in historic beer recipes from non-German speakers, so there was really no other option than to prepare the content in English, but very quickly turned into just focusing on German and Austrian beer styles and researching them much more in detail. Due to a change in jobs in the middle of 2017, I didn’t put much effort into the project for several months, and only picked up work on it again towards the end of last year. So, part of my new year’s resolution for 2018 was to release this book within the first quarter of the year, which I’ve successfully managed. In the end, it was quite a bit of work to clean things up and get everything right. Thanks to everyone who was willing to proof-read the book beforehand and give me some feedback! To give you a few insights into my nerdy ways of creating the e-book, let me describe my workflow. Just skip this paragraph if you’re not into geeky e-book software for programmers. Essentially, I used the Markdown format to write my book, with one file per section. It’s a simple text-based file format for documents which can then be converted into a number of other file formats by using various different tools. One of them is called pandoc, and is probably the most powerful converter of text file formats. It does a pretty good job converting a bunch of Markdown files to e-books, in particular the epub format. I also used it to produce a PDF file for easier reviewing, and used a tool named kindlegen to convert the epub file to .mobi, which I ultimately uploaded to Amazon for publishing. To build all these files, I used an old-fashioned Makefile, so whenever I edited any of the Markdown files, a simple “make” command rebuilt all files (.epub, .mobi, .pdf). To create the cover design, I used gimp. The cover image was painted by Eduard Grützner in 1912 and in the public domain. I downloaded it from Wikimedia Commons. All in all, it was a great experience to work on the book. I learned a lot myself, discovered lots of interesting and exciting details about German beers, and I hope this e-book helps me get the word out that there is a side about German beer culture that goes way beyond the typical association of pale lager beers, Pilsner, and Bavarian wheat beer. That side has long been neglected, and was mostly replaced by modern lager brewing, but just that the fact that historically, there has been a beer tradition that is entirely different from modern German beer, is worth celebrating and worth spreading the word about. And my book is just a glimpse, there were literally hundreds of local beer styles around, while my book can only cover those for which specific recipes were preserved and documented. Unless more historic sources are uncovered, many old German beer styles may be lost. So, if you’re a homebrewer, or a craft brewer, and you’re interested in exploring something new that is actually old, read my book, brew these beers, and help these styles have a revival. It worked for Gose, a beer style that was functionally extinct for several decades, and is now one of the most popular beer styles of the international craft beer scene, so I think it can work for other German beer styles, as well. 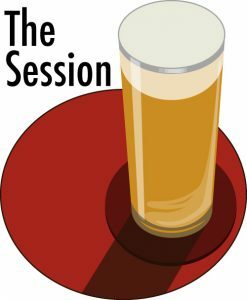 This is my contribution to Session 132 (aka Beer Blogging Friday). My homebrewing “career” started in December 2012, when my girlfriend (now wife) and I decided to just try out brewing with an electric preserving cooker and a mash bag. The first beer was not great. I got a terrible recipe from a German homebrewing website which was described as a Bass clone. In retrospect, now that I know more about beer, it was completely misguided, as it used Vienna malt as base malt and German caramel malt, didn’t prescribe a specific hop variety nor a specific yeast. Luckily, I bought East Kent Goldings, not that I had heard about the variety before, but because the name sounded good to me, and Wyeast 1318 “London Ale III” yeast because hey, it was advertised as an English strain. We bottled the beer way too early, so it turned out way overcarbonated. I may have also overdone it with the hops, so it was very bitter, but in a pleasant way. In total, there was something about it that reminded of a typical German brewpub beer. My wife usually mentions this early period as the time when all our beers had “this homebrew taste”. Despite these issues, we didn’t give up brewing, but continued with a stout (bought as an all-grain kit) and a Hefeweizen (also an all-grain kit), both of which turned out okay. The fourth beer was a special one, though. I was confident enough to somehow come up with a recipe myself, and I wanted to brew an IPA: not for us, but as a wedding present for a friend of mine who had spent three months in San Diego just a few months earlier. I read up on which hop varieties and which malts would be alright for an IPA, and the end result was actually pretty tasty. I even documented the recipe a few years ago in this blog, and looking back, I didn’t do too bad of a job. Putting together my own recipes actually got me even more interested in homebrewing, because I suddenly realized how much of a potential for creative freedom there was in brewing: so many different techniques, ingredients, and beer styles, you could brew anything you wanted. Also around that time, I got a copy of Graham Wheeler’s Brew Your Own British Real Ale, a collection of over 100 clone recipes of more or less well-known British ales. Reading through it and comparing the recipes gave me a feeling for how recipes could be designed. From there on, with very few exceptions, practically every recipe was something I had put together myself (I think the only exceptions were a Black Sheep Best Bitter clone from said book with a weird diacetyl note, and a Heidenpeters Thirsty Lady clone), not all of them were great, but most of them taught me something new about brewing. Besides the brewing itself, we also started going regularly to a Berlin craft beer meetup organized by Rory, who had an extensive knowledge about the Berlin beer scene and beer itself, and regularly organized visits to various breweries, craft beer bars, as well as beer tastings of different sorts. Anybody who has been involved with beer in Berlin within the last few years knows Rory, that’s how tightly he held the Berlin craft beer scene together. At some point, he organized a meetup of people from that craft beer meetup that were brewing at home, and a spin-off homebrewing meetup was started. While there had been occasional homebrewer-organized events in Berlin before, they were very irregular, usually German-speaking only, and more focused on just visiting bars. Rory’s homebrew meetup was different: very international, mostly English-speaking but not excluding German speakers, very open-minded, and very beer-focused. Everybody could just bring their own beer, and we would just taste one after the other, discuss them, and give feedback. It was well-structured, and very enjoyable at the same time. From these tasting, both guided tastings of commercial beers, and relatively unguided tastings of homebrewed beers, opened up a horizon of flavours (and off-flavours) that I otherwise probably wouldn’t have been able to experience. For some time, we even had themed tastings, where we’d e.g. all brew a Belgian style beer, or a Porter, or the same base recipe but everybody used a different hop variety. These themes made the meetups something that you could look forward to and work towards. I think only in retrospect I realized how much of a nucleus of the emerging Berlin craft beer scene this homebrew meetup was: Thomas Wiestner who later co-founded Braukunst Wiestner was a regular participant who brought a lot of great and creative beers to the meetups. The two founders of Pirate Brew were there quite a few times, giving us crazy stuff to sample. The founder of The Mash Pit, Christian, helped organize the homebrew meetup, and usually provided us with the space to meet. A few people who I met there did beer sommelier trainings, and are now running beer tastings and homebrewing courses. It was a forum that inspired and encouraged people to do creative things, and to brew more exciting beer. All these impressions had an impact on me as well: not only did I understand beer and its nuances better (or so I’d think, at least), it made me appreciate the craft of beer brewing more, because the close contact with all the processes (even just on a small scale at home) made me realize the complexity behind brewing as such. Don’t get me wrong, I think homebrewing is a hobby that is easy to get into as long as you can make porridge, read a thermometer, follow general instructions, and prepare well enough in advance to have all the necessary equipment and ingredients ready to go. But beyond that simplicity lie so many details, and the phenomenal thing about homebrewing is that you can explore all these details: you can just work on perfecting your single favourite recipe, you can experiment with different hop varieties, you can brew all the beer styles you’d like, you can use the most outlandish ingredients beyond just hops, malt, hops and yeast (as long as it’s not beetroot; I’m serious). You can do lager brewing, or explore decoction mashing, or strife towards the perfectly juicy double-dry-hopped NEIPA. Or, what I’ve been doing, explore historic beers both in theory and practice. For me, beer is an ongoing journey, and the hobby of homebrewing, for the last few years, has been a reliable companion. I think it improved my understanding of beer as a whole, and for sure it will for the next coming years, if not decades. There’s still so much more to explore, so much more to try out, so much more to document and write about. I met and learned to know people that I otherwise would have never ever met in my life, and I looked into subjects of which I would have never ever thought that I’d be even remotely interested in them. And because of my rather positive and pleasant experience that homebrewing has been to me, I can only recommend to everyone who tries to understand beer better or get a different view on it: do get into homebrewing. At least try it out once. It’s an interesting hobby, one that is incredibly satisfying and rewarding, where you can learn about all the ins and outs of a drink that at its core is incredibly simple and yet can be totally complex. Recently, I came across “Handbuch der Brauerei und Mälzerei”, published as three books from 1930 to 1935 by author Franz Schönfeld, who some of you may know as the author of “Die Herstellung obergähriger Biere” from 1902 and its updated version “Obergärige Biere und ihre Herstellung” from 1939. This “manual of brewing and malting” is more technical, and focuses on beer ingredients (first book, published in 1930), malting (second book, published in 1932), and brewing (third book, published in 1935). When going through all three, I found a list of common hop varieties and their distinction which I think reflects hop varieties around that time quite well. The last one was particularly interesting, because it solved a big question that I asked in 2016, what hop varieties used to be grown in Austria (and formerly Austrian lands) before Styrian hops were replaced with Styrian Goldings due to an issue with hop disease, and before Upper Austrian hops were uprooted. As it turns out, the hops grown in Styria were simply Saazer with local terroir! There’s still another question surrounding Styrian hops, and that is when the change from Saaz-derived Styrian hops to Fuggles-derived Styrian Goldings due to an alleged hop disease issue happened. Many source say in the 1930’s, and at least major cases of downy mildew can be corroborated through the Joh.Barth&Sohn-issued annual hop reports: in the 1934/35 report, Poland and Yugoslavia are mentioned as two countries who have been indifferent about Peronospora (downy mildew) in the past and now have to pay the price for it through crop failures. But (Styrian) Goldings are mentioned in earlier issues of the same report: the 1931/32 report mentions both Goldings and “late hops” being picked in Slovenia. The 1926/27 report mentions both varieties, with the “late hops” only being grown on 90 hectares (ha) of a total of 1150 ha of hop gardens in Slovenia. The “late hops” suffered from Peronospora, while the quality of the Goldings was good. Earlier Barth reports give no insight into which hop varieties were grown. So what we do know from these reports is that the change from the old Styrian variety to the newer Styrian Goldings variety must have happened in the years before 1926/1927. During that time, Slovenian hop farming went through huge changes: where Styria grew 1788 ha of hops in 1914, that area had shrunk to just 855 ha in 1917, and to a mere 400 ha in 1919. From then on, the hop acreage grew dramatically to 850 ha in 1924 and reached its peak of 3000 ha in 1928. In 1930, it took another drop to 1380 ha, but slowly recovered to 1850 ha in 1937, roughly the size before World War I. During these many ups and downs, it is very likely that new hop gardens were planted with Styrian Goldings, whereas old hop gardens that were abandoned were more likely old Styrian hops. But this is more speculation on my side, so that question when this change really happened is still unanswered. 2017 was a bit of a slump for me in terms of homebrewing: my keezer broke (and was unfixable), I was generally too busy with work, and didn’t really have that much motivation. Due to a broken keezer, I had to dump beer, and I brewed some terrible beer afterwards which I also had to dump. I also dumped some aged beer, such as my Berliner Weisse Starkbier, because the vinegar note was just too strong on it (not an Acetobacter infection, but a contribution of Wyeast 5335 which can produce acetic acid). Also, I noticed that my beer taste has changed a bit over the last 2 years, so brewing overly hoppy stuff just isn’t for me anymore. So over the course of 2017, I developed the idea that I wanted to refocus my homebrewing efforts, develop my skills and improve my knowledge. A pinnacle in homebrewing is certainly lager brewing, and since this is actually the kind of beer we drink most in our household (there’s always a crate of Augustiner Helles or Edelstoff in), I decided to exclusively brew lager beers for the whole year of 2018. Thankfully, my father got us a commercial refrigerator as an (early) Christmas present, which now not only functions as a beer fridge, but also controls fermentation temperatures quite well. I already have one batch of Helles currently lagering in there, so I actually kind of already started with this new year’s resolution, but in any case, I plan to stick to it at least until December 31, 2018. I also have the ingredients for two more beers ready to go: one of them will be the historic Vienna Lager I kept blogging about in the past, with the right ingredients, OG, FG, attenuation, hopping rate, and mashing regime. The other one is the Helles recipe which I crowd-sourced for fun through Twitter polls back in October. My other new year’s resolution for 2018 is a matter of procrastination. In late 2016, I published a German-language e-book about historic beer styles. After that, I started working on an English-language e-book about historic German and Austrian beer styles. It’s been a lot of work, I went through an incredible amount of sources just to find out all possible details about classic German beer styles, some of which are practically extinct. Unfortunately, I also hit a bit of a rough spot where I wasn’t really happy with the detailedness of some of the styles that I had researched, and where I generally wasn’t motivated enough to continue working on it. But hey, that’s why I decided to self-publish, right? No advance money, no deadlines, no pressure from publishers. Therefore, my plan for 2018 is to finalize the book and publish it within the first 3 months of 2018. I think I’m actually pretty close, it may require a few finishing touches here and there, and maybe a less robotic writing style (that’s what you get when most of the writing you’ve done in your professional career is technical documentation), and it should be presentable enough. Should I not keep this new year’s resolution, you’re free to call me out on it! As a followup to my last article on Beer Blogging Friday, “Beer at the Oktoberfest 120 years ago“, I looked more closely into which beers were advertised as being served at the Oktoberfest. This of course is not a comprehensive list of all beers that were served, but merely those that were advertised. Also, the list is not complete, but covers the years 1882, 1893-1900, 1903, 1905, 1910, 1926, 1929, 1932, 1935 and 1936. Starting in 1882, the beers advertised then were Löwenaktien-Braubier, aka Löwenbräu (without being more specific about the style), a Doppel-Bier from Bürgerliche Brauerei Munich, and the Märzen-Export-Bier from the brewery “zum Franziskaner und Leist”, later better known als Franziskaner-Leist-Bräu, besides Spaten one of the breweries owned by the Sedlmayrs, and allegedly the first brewery to brew a 16°P Vienna-style Märzen especially for Oktoberfest in 1872. The Märzen-Export was also served in a beer tent that is still around nowadays: Schottenhamel. In the 1890’s, the number of breweries advertising their beer and the tents and stalls at which they’re served increases, and even breweries from outside Munich serve their beer, like Anton Dreher‘s Kleinschwechater Brauerei, or Bürgerliches Bräuhaus Budweis. Most breweries served Märzenbier, like Pschorr, Bergbräu (a relatively short-lived 19th century brewery located in Giesing), Kochelbräu, Thomasbräu, Münchner Kindl, Hacker, Franziskaner-Leistbräu, Bürger-Bräu, Eberlbräu, and Löwenbräu. Some breweries, like Thomasbräu or Bürgerbräu, also served more than one beer, like Thomasbräu-Pilsner and Bürgerbräu Doppel-Bier. Also, fancier large beer tents were established. Besides the well-known Schottenhamel, others like Wintzerer Fähndl. In the early 20th century, the breweries advertising their Oktoberfest is consolidating towards Munich breweries. Augustiner for the first time is advertising their Märzenbier in 1903. In 1905, 6 Munich breweries can be found in ads, offering a total of 9 different beers. In 1910, it’s 10 breweries with 13 different beers. Some breweries sold a Märzen and a pale lager (like Thomasbräu), others, like Wagnerbräu, had a Märzen and their Auer-Kirta-Bier, which is mentioned as being a dark lager, and, as the name suggests, was brewed for the Kirta in Au, a south-eastern district of Munich. In the 1920’s, this diversity seems to have disappeared, as 8 different breweries advertise one beer each in 1926, mostly Märzen, with only two exceptions: Thomasbräu Hell-Urtyp and Schramm’s Fest-Weizenbier. Fischer-Vroni, another well-known beer tent, makes its first appearance in advertising, serving Augustiner Märzen. In 1929, Wagnerbräu is again seen with their Märzen and the Auer-Kirta-Bier, Schneider & Sohn have a Wiesen-Edel-Weiße, and Augustiner for the first time advertises their Edelstoff hell. In the 1930’s, beer diversity, at least in advertising, seems to go up again: Wagnerbräu offers 4 (!!) different beers in 1932: Oktoberfest-Märzen, Auer-Kirta-Bier, “Weißbier Münchener Weizengold”, and helles Export. In 1935, a large amount of breweries advertise two different beers, and Fischer-Vroni must have switched from Augustiner to Wagnerbräu between 1929 and then.